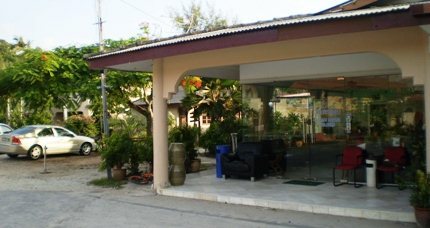 This is another nice budget hotel with excellent location on Cenang beach. The property is located opposite to Cenang Mall and within minutes walking distance to Underwater World. 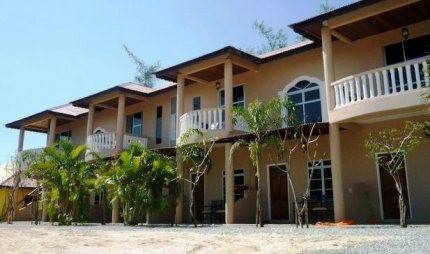 So other than great beach access and ocean view, the location is also convenient in terms of shopping, attractions & activities and eateries. The access to the property is from the main road of Cenang (i.e. Jalan Pantai Cenang). As you enter into the premises, you will see a glass covered reception area right in front. The reception is a separate unit. To its left is a large parking area. So if you have a car, no problem with safe parking within the hotel premises. Behind the parking are the rooms. The new building is two storeyed and extends all the way up to the beach (well almost). There is a pathway in front of the building that leads down to the Cenang beach. The rooms in the old accommodation (single storey chalets) mostly have garden view with exception of some chalets which are almost right on the beach. However the beach remains accessible from all units within a maximum of half a minute walk down the pathway. The upstairs rooms in the new building have balconies, you get wonderful side-view of the beach and ocean from many of these balconies. Ground floor rooms have little patios in front. Cute chairs are laid out at the balconies and the patios for you to relax and soak in the outdoor charm. Water pipes are installed below (in front of the downstairs rooms) so that you can wash off the sands from your feet before you enter your room. The hotel has 53 rooms of different types - standard garden view and beach view rooms for couples, superior garden and beach view rooms for family of three, deluxe rooms for 4, super deluxe for 6, and apartments with two bedrooms each for 6 persons. Room rate includes breakfast which is served at the hotel's cafe. The cafe is also open to public. Rooms in the new building are clean (not saying that ones in the old accommodations are unclean). They all have standard amenities like color wall TV (with limited Astro channels though), mini fridge, air conditioners, coffee maker etc. You can also ask for iron at the reception. There is no phone in the rooms which means you can't call for room service. Bathrooms are also nice and clean with hot & cold showers. Overall quite cozy settings. If you like beach view, take a room close to the beach. However the downside to this could be noise from the public beach till late at night. The in-house restaurant (known as Yellow Cafe) is quite nice. Although the breakfast which is included in the room rates is nothing special (standard spread like toast, egg station, sausages, tea etc), the food served in the restaurant is quite good and I must say quite reasonably priced compared to outside food. As an example the fried rice we ordered came in large portion (only RM8) along with fritters, fried eggs and satay... great value for money. Staffs are friendly and cooperative. Free wi-fi (password given by the staff) is available at the lobby area and also at the restaurant. Ample parking is available in front. Tour packages are offered. Safe deposits available at reception. 1) Like many other beachside hotels in Cenang, location is quite excellent. But being opposite to the Cenang Mall and close to Underwater World, Mc Donalds and Duty Free shops like Coco Valley and Zon (cheap beer etc), it gives you an additional advantage. 2) The rooms are clean. The sea view rooms are really nice and comfortable. Rooms are quite spacious and can easily fit in an extra bed. Their charges for extra bed is also quite reasonable compared to many other hotels of its category. The beds and the mattresses were quite comfortable too. So fairly good sleep at night. 3) The air-con worked really well. May be that's because we stayed in the new building and almost everything was still new. 4) The food in the restaurant is economical and quite nice. Service at the restaurant is also quite good. 5) Staffs are friendly and courteous. 6) Several electrical plug points in the rooms ... so no need to carry your extension chord. 7) Overall a great value for money. I can recommend a stay here. 1) I think the breakfast spread can improve. After a couple of days stay here, it gets a bit monotonous. 2) No toiletry is served in the bathrooms except for shower gel, So carry your stuffs. 3) Sometimes it can get quite noisy because of inconsiderate fellow guests or public from the beach. The rooms should have been more sound proof. 4) No phone in the room is a disadvantage. For anything you require, you will need to walk down to the reception. I can understand that. Being a budget hotel, they are cutting down on additional manpower to offer room service.